By the end of April 1964 advertisers, realising the huge size of Radio Carolin e's audience and the apparent absence of any official action against the station were beginning to lose their initial inhibitions about buying airtime. The very first commercial on the station, aired on 1st May 1964, was for Woburn Abbey, a stately home opened to the public by its owner, the Duke of Bedford. Increased attendances were reported by the Duke in the days immediately after transmission of this commercial and soon afterwards other advertisers also began booking airtime. Amongst early Radio Caroline advertisers were national clients such as Harp Larger, News of the World, William Hill's Turf Accountants, Ecko Radios, Bulgarian Holidays, Peter Evans Eating Houses and Kraft Dairylea Cheese. 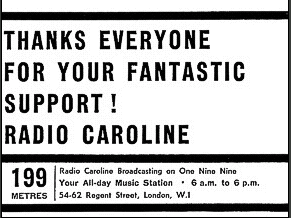 By-mid May 1964, after six weeks on the air, Radio Caroline had firmly established itself with listeners and a growing number of advertisers. 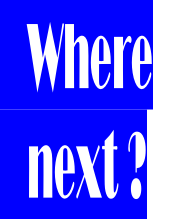 The station had also succeeded in establishing beyond doubt that there was a substantial demand for the service and style of programming it broadcast. To help meet the ever growing number of enquiries from listeners for information about the station and its DJs a Caroline Club was launched in June 1964. Listeners who joined the Caroline Club were sent a membership card, a booklet with details about the ship, the station’s background and signed glossy photographs of the DJs as well as a car sticker and a lapel pin badge. Caroline Club wrist bracelets and car badges were also available to purchase and special promotions and offers were also made available for Club members. 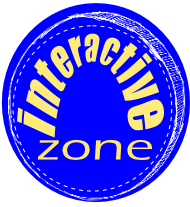 Meanwhile Allan Crawford’s rival station, Radio Atlanta, began test transmissions on 9th May 1964 with regular programmes starting on 12th May 1964 on a frequency a mere whisker away from Radio Caroline's. 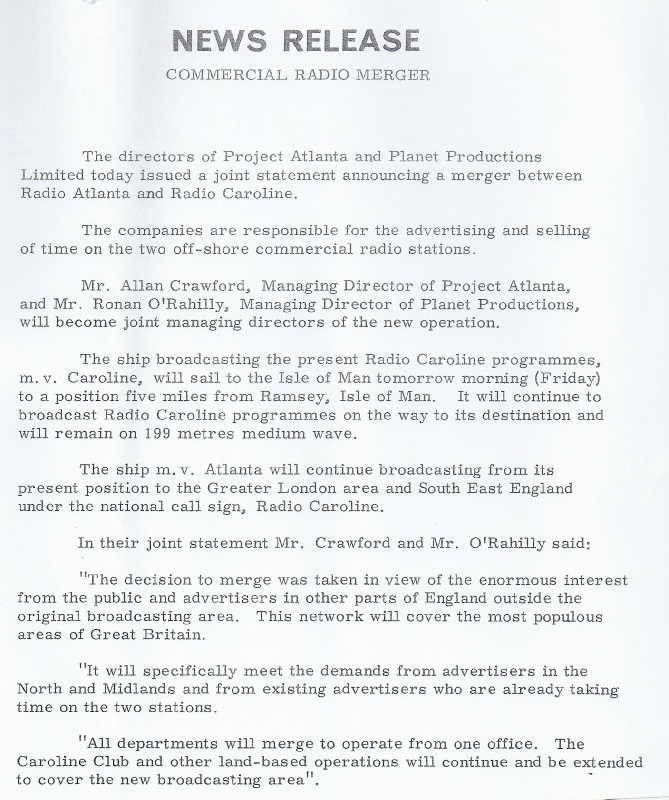 With the history of close links between Radio Caroline and Radio Atlanta since their inception a nd the fact that they were both targeting the same audience in the south and east of England it is not surprising that by early June 1964 rumours began to circulate about a merger between the two rivals. 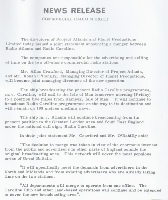 After more than a month of negotiations the directors of both stations agreed to a formal merger and a joint press release was issued on 2nd July 1964. Without any ceremony Radio Atlanta ceased broadcasting from the Mi Amigo at 8.00pm that evening (2nd July 1964) and, after Radio Caroline had also closed for the day, the MV Caroline sailed to within a mile of the former Atlanta vessel, Mi Amigo. Arrangements were then made to enable Radio Caroline to commence transmissions at 6.00am the next morning as scheduled, not from the MV Caroline as it had since the end of March, but from the former Radio Atlanta ship, Mi Amigo. The intention was that it should not have been obvious for Radio Caroline's listeners that overnight the station had completely transferred operations to what had formerly been a rival radio ship. Because Radio Atlanta's programmes were mostly taped on land the Mi Amigo had no DJ crew and no on-board record library, although there were turntables and a microphone in the studio which had been used in the days of Radio Nord. In order to retain some programme continuity and familiar voices for Radio Caroline's listeners in London and the south east, DJs Simon Dee and Doug Kerr, together with a small supply of records and tapes, were taken in a tender from the MV Caroline across to the Mi Amigo to prepare for the next days broadcasting under the new call sign, Radio Caroline South. With essential wiring work not completed until about 5.40am, Radio Caroline South only just made it on air as scheduled at 6.00am on 3rd July 1964.